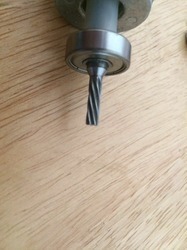 We are offering Geared Armature Shaft to our clients. We are offering Mild Steel Armature to our clients. These are used in Armature assembly of Automotive motors such as Radiator fan Motor , Blower Motor , A.C Fan motor etc. Our company is appreciated for the extremely reliable Armature Shafts which we offer to our clients. These are manufactured using high quality basic material and are perfectly accurate as their dimensions are concerned. We provide the flawless range of armature shafts in various specifications according to the diverse needs of customers. We manufacture armature shaft in carbon steel and alloy steel as per BS970 steel standards. Crank shafts are made through forging or machining the high quality billet. These forged crank shafts are hardened for better fatigue properties. We manufacture optimum quality armature shafts that are manufactured using AISI 410, 316, 304 and EN 19 procured from the trusted and reputed vendors. 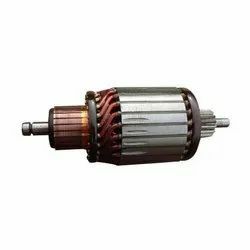 These armature shafts find wide application industrial pumps and power tool industry for induction heat treatment. We make dimension accurate armature shafts whose accuracy level range from 0.008 mm to 0.013 mm. Precisely developed in adherence with industrial set standards and norms, the provided range of Industrial Armature Shaft is strictly checked against diverse quality parameters. Our firm is highly regarded in the industry as one of the leading entities delivering Armature Shafts. This is termite free and spacious in nature. Our company is appreciated for the extremely reliable Industrial Armature Shafts which we offer to our clients. These are manufactured using high quality basic material and are perfectly accurate as their dimensions are concerned. We provide the flawless range of armature shafts in various specifications according to the diverse needs of customers.